Ytterbium is soft and ductile with a bright slivery luster. Discovered by J. de Marignac in 1878, ytterbium was named after the Swedish town Ytterby, in which it was discovered. Ytterbium occurs in nature with other rare earth metals in a number of rare minerals and is commercially recovered principally from monazite sand. 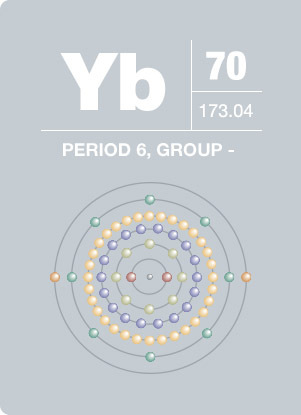 Ytterbium exists in seven stable isotopes, of which one (169Yb) has been used as a substitute radiation source for an X-ray machine when electricity is not available. Ytterbium may be employed to improve of the mechanical properties of stainless steel, such as strength and grain refinement.